That’s basically why Italians prefer to chance the location for their summer every year: at least they can easily discover new places and learn more about different culture, tradions and typical food. According to your personal tastes, after having checked on the web which things and food you are interested in, you can easily manage which of the 21 regions is the best for you for having a great Italian vacation. Especially if it is the first time you come to Italy. Unfortunately, most of the tourists who come to Italy sometimes are a little bit confused about the geography of the place, since they thought of being in a place but they are in a different one. How can that happen? 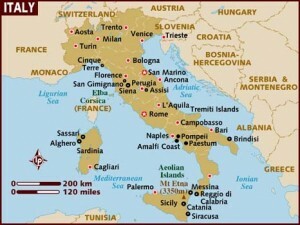 Simply because they think all around Italy there is the seaside, for example, or there is at least one lake in each of the regions, but that is not right. So, keep this in mind before planning your (next) Italian vacation.